A College Bar Called “The Chug”… What Could Go Wrong? College was great, and I think it was greater for me for one specific reason. I’d really never been anywhere else. I grew up pretty sheltered and other than a trip to Florida once, Missouri, Illinois, and Indiana once to visit Ball State’s campus, that was it. I often say, if you grow up in Iowa, anywhere you go after that is fun. So, for me, Ball State was the most exciting and diverse place I had ever been. There were people from all over the country there. I was friends with people from New Jersey and Wisconsin and California. It’s hard to make a college experience unique because, for the most part, it’s teenagers doing dumb stuff while drunk. And while I talk about partying a lot, I remember getting very offended when people acted surprised to see me in the library. I was in the library all the time, but I hid out on the top floor because they’d make a party even in the library. It was just as social of a place as the dining hall. There used to be these solid wood cubicles that were meant to divide the desks for a greater sense of privacy. We’d take some breaks from studying, and we’d get up and do flips while holding onto the sides. I could do a pretty good gainer layout step out holding onto these cubicles. My best friend Robin and our football playing giant friend Steve used to do the moves from Dirty Dancing. Robin would run into his arms and jump while he held onto her hips and it was a vision straight from the movie poster. And this was when we were supposed to be studying in the library. Needless to say, we were pretty crazy. I was probably not unlike every other college student, except that I was an athlete, and more specifically, a gymnast, which came in handy when I was trying to get into bars before I turned 21. Butterfields was one of the bars in town and on Thursday nights in the spring, everyone flocked to Butterfields and danced all night long. 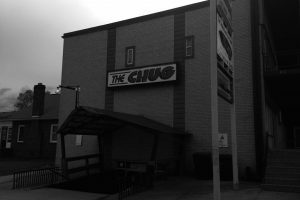 There were other bars closer to campus, like the Chug, but Butterfields was somewhat nicer and drew in the juniors and seniors. The Chug was basically a glorified dungeon. The floor was just concrete and the toilets were always flooding. There was always a layer of fluid on the floor that was either wet or in the stages of drying, so it was sticky. We just assumed it was a whole lot of spilled beer. Years later, when my friend Zork, the football player, got married, we were all together again reminiscing and I found out that that layer of fluid I thought was beer was actually pee. The football players used to bet each other who could pee under the bar next without getting caught. The entire time, I mean for four years, we thought we were sloshing around in spilled beer and liquor, but we were wading in spilled beer, liquor and the football players’ urine. Rather than get trapped in the Chug, we went to Butterfields. We couldn’t get in the legitimate way, however, for our first few years of school, but we wanted to go dancing. Butterfields had a patio in the back that was open during the spring time and it had a large wooden fence around the perimeter. Since I didn’t have a fake ID and I seldom borrowed one from an older friend or a friend’s older sister, we scaled the fences. Butterfields was further from campus, so we’d drive there together, all dolled up with our 80’s hair and miniskirts, and walk to the back of the bar. Since I was much taller than all of my gymnastics teammates, I didn’t have much trouble grabbing on to the top of the fence and hoisting myself up. That was perhaps one of the immediate and useful real world applications for gymnastics. Getting over in my miniskirt was more challenging, but because I could hold up my own body weight, I could keep my knees together as I brought one leg onto the fence at a time. I sat there, perched like a supermodel, until someone came over and readied themselves to catch me on my descent. I never got in trouble. The fun would commence with the scaling of the fence. From there, it was on! We would dance, dance and dance. Yes, we partied a lot and drank to excess often but that’s not what made the fun. Partying to us was if there was a lot of dancing happening and people getting crazy. We didn’t always drink to make this happen. Sometimes we would justify that we had to drink because our bodies were in so much pain from gymnastics we’d only be able to dance all night if we were a little numb from drinking. However, during season we stayed completely sober. People just thought we were drunk because we were so uninhibited. In general, gymnasts can really dance. It’s a huge component of the sport. When we could go out and get an amazing cardio workout all the while, having a raucous time, we were in! It wasn’t like Butterfields was the greatest club in the world, not by a long shot. But at the time, we didn’t really know any better. All we needed to have a good time was a DJ that would play the music we loved, a few fun people in the crowd and each other. In those days, at least at Ball State it wasn’t like getting caught underage drinking resulted in severe discipline. That’s the main reason I never tried pot. We didn’t get tested in gymnastics, but I never felt that pot would be worth losing my scholarships over if I ever got caught. So I just drank.